GEN Genius software from SAG Infotech Pvt. Ltd. is a complete office automation tool with a complete set of 6 modules GEN BAL, GEN IT, GEN CMA, GEN FORM MANAGER, GEN e- TDS income tax and AIR. GEN Genius software software records and maintains clients’ information including their address, telephone book, directory, partner’s details and signatory details. GEN Genius software comprehensive pack makes it very easy for the user to e-file and upload the returns without any error. SAG Infotech Pvt. Ltd is sincerely dedicated to achieving and enhancing customer relation by providing quality products through Innovation and Technology for professionals like Chartered Accountants, Company Secretaries, Human Resource Managers etc. All the products are suitable for client’s budget and professionally superior. The company consists of developers, marketing, support and administration, logistics. They have a large team of technical support staff that is proficient professionally to take care of clients and to deliver them exactly what they require. The SAG Infotech Pvt. Ltd. team of professionals works in a consistent manner. They are also trained as per the necessity of customers which guarantees the skills & abilities of employees. E-Filling of Return from Various Browsers as Chrome, Firefox, Internet Explorer, etc. Genius is a perfect amalgam of software renowned as Gen BAL, Gen IT, Gen CMA/EMI, Gen Form Manager, Gen e-TDS, AIR & Wealth Tax & billing. Facility to generate and online submission of Form 49A/PAN Correction. E-Filing of Form ITR-1, 2, 3, 4,5,6,8 is available in XML Format. Administrator can import client master data in our certain software whose client master data is of similar nature. Facility of error locator in Gen e-TDS. Tax audit report is as updated according to assessment year 2016-2017. 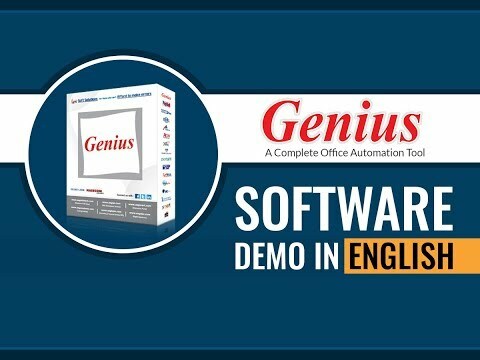 Here is the live demo of famous taxation software, named Genius Software. It is developed by the SAG Infotech Company. Q. Can I make Final Accounts according to Revised Schedule VI in GEN Genius software? Yes, GEN Genius software can make Final accounts as per latest Revised Schedule VI. Q. Can I compute Income tax from GEN Genius software? Yes, from GEN Genius software you can calculate income tax from with the option of Income Tax. Q. Can I make Balance Sheet as per Revised Schedule VI? Yes. You can now prepare Balance sheet both in New and old versions of Schedule VI as per your requirement. Q. Is there Billing Facility in GEN Genius software? Yes, GEN Genius software provides Billing Facility to maintain records of amount dues and received with ledger of clients fees for service rendered to them. Q. Can I import data from other software? Yes, in there is facility to import data from other accounting softwares such as Tally, Busy, NAC, TataEx, ACE, MCS, Focus, etc.